Based on Brown and Duguid (1991) notion of interrelatedness of learning and work practices in which learners acquire "embodied ability to behave" in a certain manner, the paper argues that personal usage of ICT within student teachers own learning will form their models of teaching practices. This paper draws on a survey conducted in 2005 at a teachers' education college in New Zealand. The aim of the survey was to examine the ways in which students are using Web- based learning technology in their initial training period. Findings of the survey reveal insights into the perceptions of students for the use of ICT in their own studies. The findings provide a snapshot into the current situation of teachers' education in relation to the use of Internet technology and online learning systems. The findings have implication for teachers' education in the new millennium. A meta-survey on the use of technology in education claims that the development of the use of ICT in the New Zealand education system is largely reliant on the ability and skills of the teachers(Prebble, 2003). Since 1998 successive New Zealand governments have facilitated ICT training and support for teachers, providing a variety of professional development programmes, such as for example the ICT- PD Clusters (Prebble, 2003). However, initial teachers' training programmes seem to lack a specified provision for ICT training. The New Zealand ministry of Education has no specific requirements for the provision of ICT modules in teachers' training programmes, and there are increasing expectations of the personal competence and ICT related pedagogical knowledge from the beginning teachers(Mawson, 2003). This situation creates some difficulties in establishing the ability of New Zealand's future teachers to incorporate the use ICT in their classrooms. Since September 2001 the college has been using an open source computer network system called Interact, designed as a Learning Community Environment, primarily geared for facilitating collaboration and the construction of online communities. The pedagogy underpinning the development of Interact was based on socio- constructivist notions of collaborative knowledge construction such as those expressed by Vygotsky(1978). The model of learning advocated by social constructivists is that of collaborative negotiation of meaning rather than instruction, and control of the learners and the learning process (Jonassen, Davidson, Collins, Campbell, & Bannan Haag, 1995), and is aligned with the educational aspirations expressed by New Zealand Governments in the "Digital Horizons" document. Interact has been implemented throughout all the sectors of the college to include faculty, students, and administration, and is used for supporting administrative, as well as teaching and learning functions. This implementation model provided a comprehensive insight into the ways in which student teachers are experiencing ICT use during their initial training. Successive New Zealand governments encouraged by the Information and Communication industries accepted that the country's future lies in the Knowledge Economy. The Digital Strategy draft document published in 2004 by various New Zealand government agencies outlines the benefits of ICT for the New Zealand society in realising its economic, social, and cultural goals. The New Zealand Ministry of Education is keen to see schools integrating ICT more fully into curriculum practices, and encourage all learners to use ICT confidently and creatively in ways that will enable learners to achieve personal goals and fully participate in the emerging global knowledge society, in which New Zealand is expected to become increasingly active (Binde, 2005; Government, 2004; Minedu, 2003). Today's young generation are expected to become active participants in the surrounding Knowledge Society, using complex communication networks for rapidly developing and exchanging information (Kankaanranta, 2005). Integrating ICT and network technologies in schools will increase the opportunities for students to gain experience in the use of communication networks. Teachers play a crucial role in the adoption and implementation of ICT in education, however, studies show that teachers lack the necessary ICT knowledge and skills (Pelgrum & Law, 2003). A survey conducted across 16 European countries investigating teachers' professional development in ICT, found that in most countries, respondents referred to training programmes for in-service teacher, whereas initial teacher training was mentioned remarkably less. More than half of the countries pointed only to training programmes for in-service teacher training. Six countries included both initial and in-service training programmes in their statements. (Balanskat, 2005p.21-2). A national survey of the ICT skills and attitudes of students entering and graduating from teacher education institutions in Scotland (1996-7) revealed that students are extremely positive in their attitudes, their enthusiasm for ICT use in their professional work, however, their experiences during their period of training fell considerably short of their expectations(Simpson, Payne, Munro, & Lynch, 1998). Initial Teacher Education institutions obviously have a key role in the development of ICT within schools. However, the implementation of training seems inconsistent as it tends to focus on in- service teachers while neglecting to introduce ICT programmes in initial teachers training programmes. New Zealand seem to be following the European trend, as the New Zealand Ministry of Education has not specified a requirement for the provision of ICT modules in initial teachers' training programmes. In view of the situation this paper will investigate how student- teachers utilise ICT in their own learning. Following Brown and Duguid(1991) interrelatedness of learning and work practices, this paper explores the student's perceptions of what and how ICT should support their learning, suggesting that the experience student teachers gain during their student years, will impact on their ICT practices as teachers. A survey questionnaire was developed, and circulated among a number of staff members for review and feedback. Comments, recommendations, and requests conveyed by the reviewing staff were incorporated in the final version of the questionnaire. A random sample of the college students participated in the survey. The survey included multiple -choice questions, and open -ended ones. The data obtained in the multiple choice questions was quantified. The open ended responses were analysed using Balbi and Di Meglio's(2004) Text Mining approach which uses Text Categorisation for identifying key words leading to the generation of contexts emerging from unstructured texts. The survey questions encompassed issues of technology, its usability, effectiveness for users, and its ability to facilitate successful accomplishment of users' goals and learning needs. Electronic questionnaires were available to 120 students. A total of 108 students responded. The highest response rate (35%) of the three modes of dissemination was obtained through the distribution of questionnaires by lecturers in class time. Close behind at 32% was the mail out with the stamped return envelope sent to distance learners. The electronic version resulted in the lowest response rate with a mere 2.5%. This section illustrates the findings of the survey which was disseminated in 2005 at a teachers' college, which supports on campus as well as distance learning programmes. Of the total of the108 respondents to the survey, 41 (38%) were on campus students, and 67(62%) were distance students. The findings outline the ways in which students make use of different types of media and technology, and illustrate personal testimonies of students describing the ways in which the technology supported their learning, their interactions with lecturers and other students, and the affects these had on the learning. In particular the findings attempted to highlight interactive and collaborative activities aligned with the New Zealand's government's aspirations as well as the theoretical underpinnings of the ICT system used by the respondents. First, the survey attempted to establish computer access practices and preferences. Students were asked to indicate their preferred location for using computers either on campus or from home.22 students, about half of the total of on campus students participating in the survey, noted that they prefer using the college computers. When asked about their reasons for preferring to work on the college computers, 11 out of the 22 (50%) indicated that it enabled them to work collaboratively with others. Table 1 below illustrates the distribution of the different reasons for using college computers. The survey investigated the student teachers preferred format of representation of learning materials, and found that 75% preferred the printed format. Students were asked to rate the effectiveness of multimedia features such as audio and video elements for their learning. 43% of the respondents indicated that it was helpful at times, only 13% found it very helpful. Posting a message: authoring a discussion forum message. This is done either in anticipation for a response of some kind or an exchange of information with others. Sharing and receiving comments: continues rapport with others where sharing and interchange of ideas takes place. "I have been really frustrated by the number of people who read the questions or comments but don't respond. In the beginning I would post in each course, but it became apparent that other students were not using it as a means for dialogue, so I stopped doing it as I felt I was wasting my time". Table 2 describes a situation of an unfortunate loop in which people cease to participate in the online discussion and perceive it as a 'waste of time' because 'other students are not using it as a means for dialogue'. This loop phenomenon is fully realised when analysing all the other types of interactions shown in the table. Posting a message to a discussion forum is usually an invitation to some type of interaction. According to table 2 a total of 70% ( 5% on several occasions 20% on some, and 45 on rare occasions) did initiate an invitation for interaction. However, 65% of the participants indicated that they have never contributed comments, 61% indicated that they never exchanged information. In other words, people initiated a conversation on the one hand, but refrained from responding to other people's invitations, resulting in breakdown of communication. This situation illustrates a discrepancy between what people expect from discussion forums and what happens in reality. "It [discussion forums] is good because you know that someone is going to see your posting and be able t help you out". "Using the forums is effective in getting responses from lecturers for all concerned. Students can also 'talk' to each other via Interact". Posting questions and concerns on Interact enables the lecturers to respond and often their answers help many people with the same concerns. Communication with other students is a lot stronger than it would be without Interact. We are able to see others' postings and have the opportunity to share out thoughts". "Talk to others wouldn't normally[without the online system] get to. Process questions and comments also. Can leave class mates messages etc". "I prefer to get an email rather than spend ages on Interact looking for communications that aren't often there. Would be OK if lecturers posted things regularly". "I have made postings, and haven't had reply from my lecture….."
"I find it terrible how you often ask lecturer a question and they don't reply"
Others mention the lack of response from both students and lecturers: "….. lecturers and students not answering questions….."
The survey reviewed the ways in which participants found the use of Interact as supportive to the learning. Measuring the frequency of appearance of reoccurring words such as good' useful' 'support', 'communication', 'helpful', 'extra', 'fantastic', 'available', and 'easy' enabled the construction of a rough sketch of students' expectations of the system, and the level to which these expectations were met. "My use of the' interact' has mostly to locate information, assignments templates, etc. which has been most helpful to my learning". "keeping up –to-date with assignment requirements and due dates…." The findings indicate that students predominantly see the system as a source of information to be disseminated by the lecturer and course administrators. "There is a wide variable amongst lectures who make good use of Interact as a form of communication. The course which were regularly updated and monitored gave the best support and the highest level of communication"
The analysis section follows the same subtitles introduced in the 'findings' section. The college's computer suits enable students to work together, view each other's computer screens, exchange comments, tips and help each other. 11 out of the 22 on- campus students chose to use the college computers for the opportunity of enjoying the company of their peers, indicating that the students' value the opportunity for sharing and collaborating with peers. Course design: are courses designed primarily around reading printed material? Technology of e- documents and e-books: are the technological solution available providing satisfactory conditions for reading long electronic documents? The culture of teaching and learning: are students and lecturers willing to explore non- traditional media of delivery? 43%of the students found the use of video and audio components as helpful at times. This rather ambivalent response is contrary to the wide use of visual and sound so ubiquitous in today's world. The scope of this study did not allow for further investigation of this finding, and further study is needed for identifying the reasons behind the phenomenon observed. Possible routes for explanations implied in literature will be discussed in the summary of this section. Ascertaining the reasons for the findings in this case is beyond the scope of this paper; however, the current findings shed some light into areas needing further investigation. The survey showed very low levels of exchange, sharing contributing and commenting on each others materials. Once again the reasons for this could be similar to the ones I have outlined earlier. It may be that not enough preparation and exposure to these features was done in the level of lecturers or the students. The findings may well be an indication of the fact that lecturers, as the ones responsible for designing and leading the courses, have not made the pedagogical shift and are not yet ready to implement current pedagogies where students will be more active, and the role of the teacher will become that of a facilitator rather than a transmitter of information(Duffy & Cunningham, 1996). Similar to issues raised in previous items in this section, the effective use of Interact was again attributed to lecturers' response. The need for lecturers' response has to do with students requiring lecturers' presence, and the assurance that someone, 'out there', is listening. The low percentage of students who perceived interact as a tool for communicating with other students highlights a fundamental finding, indicating that learning is still perceived as teacher centred activity in which students receive information and instructions and act accordingly. Preferred Medium -The overwhelming (75%) preference to print media implies a traditional approach to the presentation of learning materials. Further strengthening this finding could be attributed to the high percentage of response to the printed rather than the electronic version of the questionnaire disseminated for this study. Interaction and collaboration -The relatively low use of the social collaborative features supported by the ICT system interact, may imply that the social learning pedagogy underpinning the design of Interact have not been widely implemented, and practices seem to fall back on the more traditional teachers' centred approach. 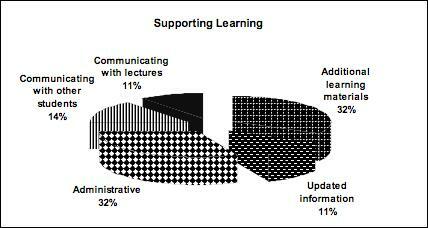 This observation is supported by the findings shown in figure 4 indicating a relatively high use of the system for obtaining learning materials and course administration information. The two key findings stand in relative contrast to the general view that ICT use is rising, and that young people in particular are high users of audio visual functions supported through ICT(Oblinger & Oblinger, 2005), and are keen users of interactive social networking technologies such as MySpace or Facebook (Lenhart & Madden, 2007). A closer investigation of the nature of the use of technologies such as iPods, picture phones, and audio visual Web application such as YouTube, Flicker and others, and the various networking systems, reveal that they are all primarily used for entertainment purposes. It may be that student teachers do not perceive audio visual, and networking technologies to be related to work or study environments. Differentiating between different contexts of use of the technology may provide a route for explaining the low levels of use of non- print media among the student teachers. Bosah's (1998) work provides a differentiation of use of ICT suggesting a link between perceptions of use of ICTs, and the level of education and socio economic status. Bosah found that audio visual technologies are in relatively high use in the lower education and socio economic groups, and were mainly associated with the consumption of content, mainly for entertainment. However, the use of ICT in the higher level of education and socio economic status was attuned to the production as well as consumption of content, and that in this group ICT was more often associated with work and study related activities. The preferred ICTs in this group were those which offered not only consumption but also production of content (Bosah, 1998). The student-teachers in this study seem to dissociate audio visual content from study or work activities. Furthermore, although students indicated an appreciation of collaborative work when choosing to use the college computer suits where they could work face-to-face with colleagues, they seem to perceive ICT based communication as a mechanism for retrieving information rather than facilitating interaction and active production of content. According to Bosah both these findings would, point to low level of education and socio-economic status. Cameron and Baker(2004)found that there is a general belief that many people entering teaching are academically weak, indicating that student teacher may come from a background of low levels of education, usually associated with lower socio economic status, although this is inconclusive. Although the survey looked at students' perceptions, the findings shed light on the way the system is applied by the college's staff, which in turn may have affected the students' perceptions and preferences in using the technology. It may be that student teachers are willing to embrace features such as audio visual and collaborative learning enabled by the technology; however, they may lack guidance and modelling from their lecturers. Initial teacher education institutions have a key role in training teachers along the key issues identified in the Digital Horizons document, calling for the implementation of techno -constructivist paradigm, and the communication with the surrounding community. However, it seems that initial teacher training is still primarily entrenched in the traditional models and the newly qualified teachers although introduced to new technologies, are enculturated along the traditional transmission modes of teaching and leaning. Left unattended the situation will hinder the ability of the New Zealand educational system to support the skills identified by the government as supporting the country in its process of becoming a Knowledge society. It is apparent from this study that the availability of the technology itself will not instigate the aspired goals. Cultural and pedagogic change should occur for the technology to be implemented to its full effectiveness and achieve the goals it was designed to fulfil. Training the teachers of the new millennium in a way that would facilitate their experience of new technologies and current pedagogies in their own learning would as Brown and Dugid have suggested (1991), provide a key factor in enabling teachers to incorporate these in their practices as qualified teachers. 1 Some still advocate print materials as the approved and reliable source of information in comparison to Web sources. Balanskat, A. (2005). Assessmnet Schemes for Teachers' ICT Competence - A Policy Analysis European Schoolnet. Balbi, S., & Di Meglio, E. (2004). A Text Mining Strategy based on Local Contexts of Words. JADT, 2004(7). Binde, J. (2005). Towards Knowledge Societies (World Report). Paris: United Nations Educational Scientific and Cultural Organisation (UNESCO). Bosah, E. L. (Ed.). (1998). Cyberghetto or cybertopia? : Race, class, and gender on the Internet. Westport, Conn.: Praeger. Brown, J. S., & Duguid, P. (1991). Organisational Learning and Communities of Practice: Toward a unified View of working, Learning, and Innovation. Organisation Science, 2(1), 40-57. Cameron, M., & Baker, R. (2004). Research on Initial Teacher Education in New Zealand: 1993-2004 (Research Report). Wellington: New Zealand Council for Educational Research. Duffy, T. M., & Cunningham, D. J. (1996). constructivism: Implications for the design and delivery of instruction. In D. Jonassen (Ed. ), Handbook of research on educational communications and technology (pp. 170-198). NY: Scholastic. Government. (2004). Digital strategy: A draft New Zealand Digital Strategy for Consultation. Wellington: Government Ministries. Jonassen, D., Davidson, M., Collins, M., Campbell, J., & Bannan Haag, B. (1995). Constructivism and Computer -Mediated Communication in Distance Education. The American Journal of Distance Education, 9(2), 7-26. Kankaanranta, M. (2005). Internation Perspectives on the Pedagogically Innovative Uses of Technology Human Technology: An Interdisciplinary Journal on Humans in ICT Environments, 1(2), 111-116. Kozma, R. B. (2005). National Policies that Connect ICT -Based Education Reform to Economic and Social Development Humna Technology:An Interdisciplinary Journal on Humans in ICT Environments, 1(2), 117-156. Lenhart, A., & Madden, M. (2007). Social Networking Websites and Teens: An Overview (Report): Pew Internet and American Life Project. Mawson, B. (2003). Preparing Teachers for the New Millenium. Paper presented at the Technology, Reading, and Learning Disabilities Conference, San Francisco. Minedu. (2003). Digital Horizons learning through ICT: A strategy for schools, 2002-2004 (Strategy): Ministry of Education. Oblinger, D. G., & Oblinger, J. L. (2005). Educating the Net Generation. Available Online: Educause: Transforming Education Through Information Technologies. OECD. (1999). Human capital investment. Paris: OECD. Pelgrum, W. J., & Law, N. (2003). ICT in education around the world:Trends, problems nd prospects. Paris: UNESCO: International Institute for Educational Planning. Prebble, T. (2003). Meta-survey on the Use of Technologies in Education in Asia and the Pacific 2003-2004. Bangkok: UNESCO. Simpson, M., Payne, F., Munro, r., & Lynch, E. (1998). Using Information and communication Technology as a Pedagogical Tool: A survey of Initial Teacher Education in Scotland. Journal of Information Technology for Teacher Education, 7(3), 431-446. Vygotsky, L. (1978). Mind in Society: The Development of Higher Psychological Processes. Cambridge Massachusetts: Harvard University Press.